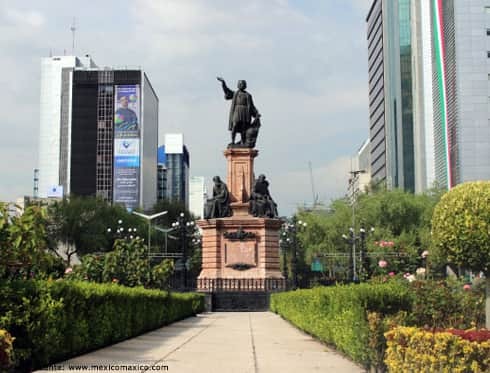 The monument to Christopher Columbus in Mexico City is located in the roundabout where the Paseo de la Reforma and Avenida Morelos meet. The sailor's figure points to the horizon (toward the city centre), and under his feet and alongside the stone pedestal are statues of Fray Pedro de Gante, Bartolomé de las Casas, Fray Juan Pérez de Marchena and Fray Diego de Deza. There are also some reliefs on the sides of the pedestal. The monument was designed by Frenchman Charles Cordier.